If you are thinking about buying new coffee mugs for your personal use or as gifts for friends, it is necessary to choose the right mug packaging box to ensure that your mug make it to it’s destination in undamaged. During transportation, it is common for mugs to knock against each other; without the proper packaging, they will end up being broken and, therefore, leave you with a set of useless broken pieces. Today we will talk about some of the main factors to keep in mind before ordering for the custom mug packaging boxes. First you have to give a thought to why you need a packaging box for your mug. For instance, you are moving to another location and want to keep your mugs safe during the transition then you will be OK to choose simple packaging. But if you are considering to send out a mug as a gift then you should choose the right packaging design and have you thoughts printed on the packaging. Mug packaging boxes come in a wide variety. Every design is crafted to provide the best protection of the cups from damage. Remember that different designed packaging boxes has different price. When ordering, make sure that you know the different price rates on different mug boxes designs so as to avoid spending too much or too little on a preferred and reliable design. 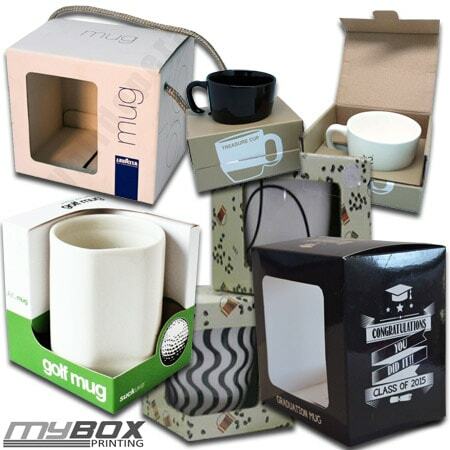 Our range of cardboard-corrugated mug packaging boxes are great in demand. Made with 350gsm cardboard and c or e flute corrugation inside, our boxes are rigid and can hold your mug and ensure it’s safety in transportation. Our CMYK or PMS printing will allow you to have ultra quality custom printing on your box. Not to mention, our clients have the option to choose matte or gloss lamination without any extra cost plus we will ship your boxes to your door, That too with no extra charges.